European polyurethane manufacturers are using 4,4'-Methylenebis(2-chloroaniline) (MOCA), as a reliable, cost-effective curative for a wide range of TDI-based polyurethane systems. MOCA offers a good reactivity profile and produces elastomers characterized by a very good combination of properties, such as tensile strength, durability, resiliency, and cut and abrasion resistance.Although MOCA is used in the manufacture of everything from wheels and gaskets to large parts and coatings, processing MOCA creates potential toxic hazards that have invited the regulatory scrutiny of the European Chemical Agency (ECHA). In 2017, the organization’s REACH regulation will restrict use of MOCA in the EU. New directives will limit and complicate MOCA use, forcing polyurethane manufacturers to search for alternatives. Some companies may keep their current TDI systems and rely instead on higher-cost alternatives, such as DMTDA. Others may switch to MDI systems, using 1, 4-butanediol (BDO) as a primary curative. Ultimately, both alternatives fail to equal MOCA’s attributes and increase the likelihood that European manufacturers will be at risk from offering inferior polyurethane products. Recognizing the newly created market conditions, Gantrade Corporation has actively sought to find solutions for the upcoming MOCA restrictions. Our technical team, located in Charlotte, NC, has developed a family of MOCA replacement products, primarily for use in TDI systems. 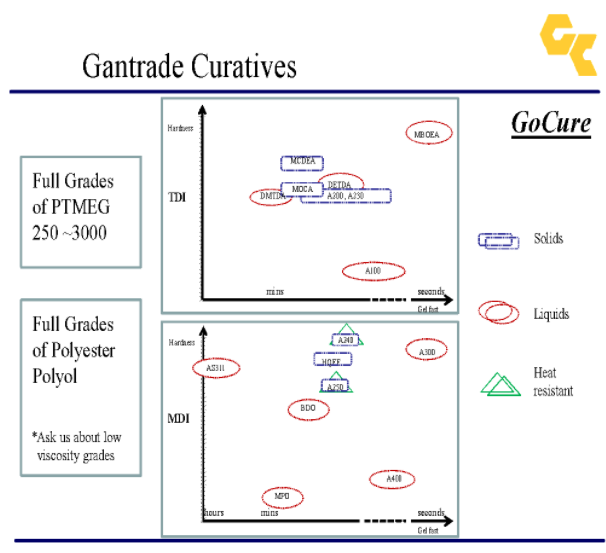 Gantrade’s GoCure A200 series aromatic curatives were developed to offer performance comparable to MOCA cured polyurethanes while eliminating most of the health hazards associated with handling MOCA. The GoCure A200 products do not contain or produce dust. They are liquid or waxy solids at room temperature with a maximum melting point of 85° C, which is ~20° C lower than MOCA. The lower melting temperatures allow processing temperatures as low as 50° C.
Unlike MOCA, the GoCure A200 products are not suspected carcinogens. In addition to eliminating the environmental concerns of MOCA, materials cured with GoCure A200 series demonstrate hardness and tensile and tear strengths that rival materials cured with MOCA. Compared with DMTDA, GoCure A200 series has demonstrated better dynamic properties in TDI systems. The physical testing data comparing GoCure A200 series and other curatives is presented in the chart below. The results of the Dynamic Mechanical Analysis demonstrate the superiority of GoCure as a MOCA alternative. In response to the new MOCA regulations, a significant number of polyurethane manufacturers have transitioned to using MDI, instead of TDI systems. The most difficult challenge has been matching the performance characteristics of MOCA/TDI systems. The most commonly used curative with MDI prepolymers is 1, 4-butanediol (BDO). BDO cured polyurethane materials (especially high-hardness ones) exhibit, usually undesired, thermoplastic behavior. BDO is also highly hygroscopic, and it requires dry nitrogen blanketing. Another common MDI curative is hydroquinone bis (2-hydroxyethyl) ether (HQEE). Although it has a melting point of 98° C, this curative easily solidifies when exposed to temperatures even slightly below its freezing point. To mitigate this, manufacturers must keep HQEE transfer lines heated, which is impacting maintenance requirements, reliability, and costs. Gantrade has developed a group of curatives (such as GoCure A243) specifically designed for use with MDI prepolymers to meet the needs of manufacturers using MDI systems. When used with MDI prepolymers, GoCure curatives produce polymers comparable to TDI /MOCA ones without the challenges associated with MOCA, BDO, or HQEE. The polymers made with GoCure curatives display good hardness and tensile strength retention even at temperatures of 177° C (350° F). BDO cured material exhibited a hardness decrease from 92A to 60A at 150° C (300° F). The hardness decreased further when exposed to 177° C (350° F). HQEE cured material had a hardness decrease from 50D to 89A after overnight exposure to 177° C (350° F). GoCure A243 cured elastomer displayed a hardness decrease from 63D to 94A after overnight exposure to 177° C (350° F). European manufacturers can assess that MDI/A243 is a solution that compares favorably to TDI/MOCA systems. TDI/MOCA elastomer’s hardness decreased from 64D to 87A after being subjected to 177° C (350° F) temperature overnight. Under the same conditions, MDI/A243 elastomer’s hardness decreased from 63D to 94A. Compared to the TDI/MOCA material, after prolonged exposure to 150° C (300° F), the MDI/A243 urethane exhibited higher tensile and Die C tear strength retention. Navigating the European regulatory landscape can be challenging for polyurethane manufacturers. We, here at Gantrade, allow our customers to tap into our strong technical knowledge and resources, to help them find the best solutions for addressing new MOCA regulations and other challenges. We understand the unique needs of polyurethane manufacturers in the industrial, automotive, construction, and medical markets. We collaborate with our clients to provide customized solutions. Feel free to check out our poster about our MOCA polyurethane curative or you can Contact Gantrade today!